With summer in Denver, CO, now in the rearview, you’ll look up at the giant aspens and see them slowly changing from green to amber and gold. At this moment, you’ll find yourself pleasantly excited for the flannel season, some cooler weather, and all the happiness that comes with the fall. Here are some of our favorite fall hikes at TAVA Waters. Hit the trail before the snow starts to fall. Located on Buffalo Pass in Steamboat Springs, Flash of Gold is the go-to place if you’re looking to see some of the most spectacular fall colors in Colorado. Flash of Gold lives up to its name by seamlessly spreading a wealth of gold across the Yampa Valley when fall arrives. With more than 11 miles of trails for biking and hiking, Flash of Gold is a beautiful trail lined with towering aspen trees. If you’re looking to get outside this summer, get your heart pumping, and surround yourself with Steamboat’s incredible fall colors, Flash of Gold is a great place to start. About 30 miles west of Denver sits Black Bear and Horseshoe Loop in beautiful Golden Gate Canyon State Park. 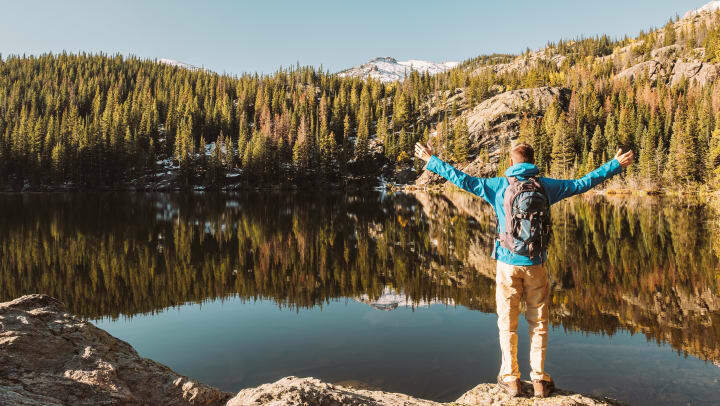 This 6-mile round-trip hike will take you up through Ralston Roost, where you can see amazing views of the Continental Divide, and then back down through a gold rush of aspen forest and wildflower filled-meadows. With this beautiful rural area being so close to the city life of Denver, you’ll feel as if you’re in your own autumn world. And the best part is Black Bear and Horseshoe Loop are pleasantly uncrowded, so keep this one a secret! Bear Creek Trail at Lair O’ Bear Park can be found in Jefferson County near Morrison. If you’re looking for an easier, more relaxing hike you can bring the kids along on, this trail is only 1.5 miles and follows a crushed-gravel path under shaded trees perfect for warm fall afternoons when you can’t decide how many layers to wear. Venture through amber woodlands and across the crystal-clear water flowing through Bear Creek. If you’re feeling lucky, you can also throw some lures in and test your luck with some beautiful brown or rainbow trout. When the weather starts to cool and the days get shorter, it’s time to get ready for the fall season. Instead of watching the leaves change from inside, head out into the world and be a part of this magical season before the snow begins to fall. If you want to learn more about what to do during autumn, check out the TAVA Waters blog.